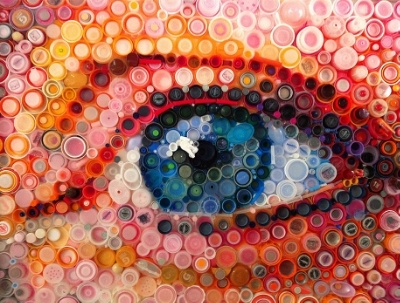 Mary Ellen Croteau an American artist creates realistic images by using different assorted bottle caps. Using the original colors of the bottle caps to create realistic shading and hues in her images. Croteau work highlights one of our biggest global issues of pollution through her work by recycling the caps into her art work. My favorite is her self portrait! To see more of her work and read more about what she does click here at Bottle Cap Artwork.